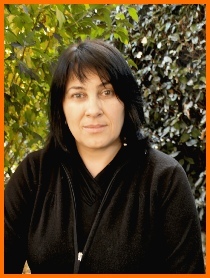 My research interest is focused on the Insect Neuroanatomy and Functional Morphology. I am currently working mainly on two different projects: (1) "The cercal mechanosensory system of the wood cricket Nemobius sylvestris: neuroanatomy and physiology" and (2) "Morphological bases of colour change in crab-spiders". 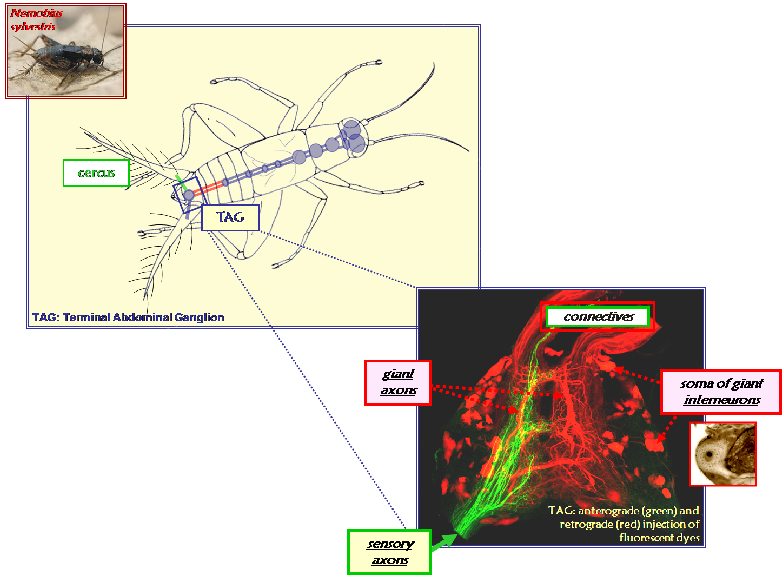 In Nemobius sylvestris, by means of Optical, Confocal, Transmission Electron and Scanning Electron microscopy, combined with general and selective neuronal marking, we analysed the neuranatomical organization of the Terminal Abdominal Ganglion (TAG), the first relay for the treatment of mechanosensory inputs from the cerci, as well as the functional implications of this organization (Figure 1). Recently I started to analyse the processing of the sensorial information by the TAG by performing intracellular recordings from Giant Ascending Interneurons (GINs), associated to intracellular staining methods. Misumena vatia is a colour changing mimetic crab-spider. 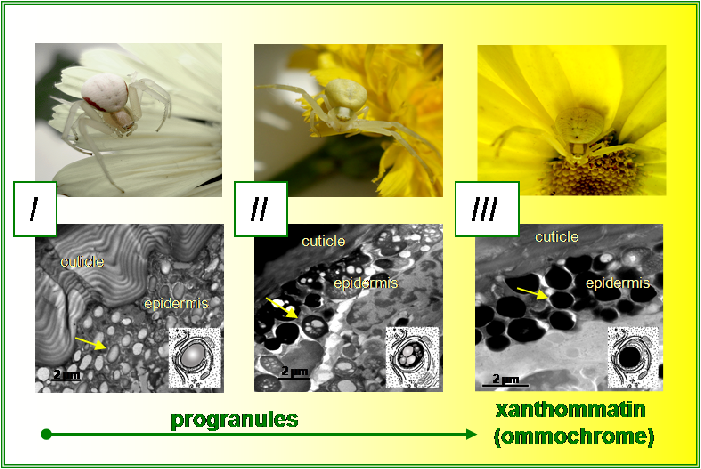 The aims of our study are to characterize the localisation of major pigments in the spider body and to describe the formation and location of ommochrome granules, responsible for change from white to yellow colour. By means of light, fluorescent and electronic microscopy, we have analysed the processes of colour change and described de formation of the pigment granules (Figure 2). Figure 1. The escape response of the wood cricket: the wind-sensitive cercal receptor/giant interneurons system. 2008 Barrozo, R. B., Couton L., Lazzari C. R., Insausti T. C., Sebastian A. Minoli, Fresquet N., Rospars J. P. and Anton S. Antennal pathways in the central nervous system of a blood-sucking bug, Rhodnius prolixus. Arthropod Structure & Development, in press. DOI:10.1016/j.asd.2008.08.004. 2008 Insausti, T.C., Lazzari, C.R. and Casas, J. The terminal abdominal ganglion of the wood cricket Nemobius sylvestris. J. Morphol., in press. DOI: 10.1002/jmor.10672. 2008 Insausti, T. C. and Casas, J. The functional morphology of color changing in a spider: development of ommochrome pigment granules. J. Exp. Biol. 211: 780-789. 2008 Lazzari, C.R. and Insausti, T.C. Circadian rhythms in insects, In: M.L. Fajul-Moles & R. Aguilar-Roblero (eds.) Comparative aspects of circadian rhythms. Research Signpost (ISBN 978-81-7895-329-8), in press. 2002 Insausti, T.C. and Lazzari, C.R. The fine structure of the ocelli of Triatoma infestans (Hemiptera: Reduviidae) Tissue & Cell 34(6): 437-449. 2002 Reisenman, C.E., Insausti, T.C. and Lazzari, C.R. Light-induced and circadian changes in the compound eye of the haematophagous bug Triatoma infestans (Hemiptera: Reduviidae) J. Exp. Biol. 25(2): 201-210. 2000 Insausti, T.C.and Lazzari, C.R. The central projection of cephalic mechanosensory axons in the haematophagous bug Triatoma infestans. Mem. Inst. O. Cruz. 95: 381-388. 2000 Insausti, T.C. and Lazzari, C.R. The postembryonic development of the ocellar system of Triatoma infestans Klug (Heteroptera: Reduviidae). Mem. Inst. O. Cruz. 95 (6):877-881. 2000 Insausti, T.C. and Lazzari, C.R. An ocellar "pupil" that do not change with light intensity but with the insect age in Triatoma infestans. Mem. Inst. O. Cruz. 95(5): 743-746. 1999 Insausti, T.C. ; Lazzari, C.R. and Campanucci, V.A. Neurobiology of Behaviour. A: Morphology of the nervous system and sense organs. En: Carcavallo et al. (eds.). Atlas of Chagas' disease vectors in America, vol. III, pp. 1017-1051, Editora Fiocruz, Rio de Janeiro. 1998 Lazzari, C.R. ; Reisenman, C.E. and Insausti, T.C. The role of the ocelli in the phototactic response of Triatoma infestans (Heteroptera: Reduviidae). J. Insect Physiol. 44(12): 1159-1162. 2005-present. Postdoctoral Fellowship (eq. Ingénieur de recherche), IRBI (France). 1991-2003. Teaching and Research Associate Assistant, University of Buenos Aires (Argentina). PhD obtained in 1997. 1988-1990. Research Assistant, Institute of Biological Cybernetics, University of Tübingen (Germany).